To celebrate my recent Birthday we decided to go to the Theatre in London to see The Bodyguard and I also wanted to take the family out for a pre theatre meal. For most people this is an easy task. For me, a little more difficult. Having multiple intolerances makes eating out very difficult, gluten, yeast and onions a tricky combination. Côte Restaurant was recommended to me as being Coeliac friendly. I sent Côte an email asking for a little more information. Charlotte from Côte was very helpful, she sent me a list of gluten free dishes. We arrived at Côte near Covent garden Tavistock street at 5.45pm and were shown to our table at the furthest corner of the restaurant. Booth type seating, quite cosy for 6 of us. We were welcomed by our waiter who then went to fetch us some water. Sadly this did take a long while to turn up, maybe if we had been ordering wine etc it would have arrived more quickly. We ordered our food, I chose 1/2 Chicken with garlic butter and Frites, I was beyond excited about the frites, I cannot remember the last time I had proper french thin fries. Charlotte was able to reassure me that the frites are cooked in a separate fryer, brilliant news. No idea why more restaurants don’t do this. The family chose Duck, Cassoulet, Moules, Steak and Chicken. The water arrived in unusual earthenware pots which was novel. 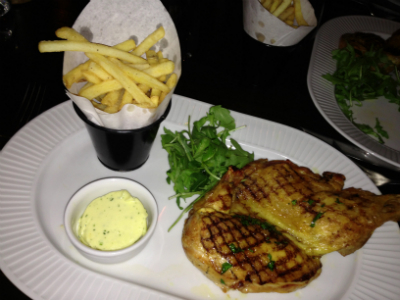 The food arrived quickly and everything looked amazing, My 1/2 chicken was absolutely delicious especially with the garlic butter and the Frites definitely lived up to my expectations, glad I ordered an extra side of Frites for the table ( for me really ) Everyone enjoyed their meal choices and we will be booking a return meal at Côte Restaurant very soon. Fortunately there are nearer Côte restaurants to us in Surrey. It was the first meal in a while that I felt totally confident that it really would be gluten free, which makes such a difference to the evening for myself and the family. The one thing I could see that could be improved upon would be the addition of a GF sign next to each meal choice that is gluten free. I imagine this would be very easy to do. I would never have chosen this restaurant If It hadn’t been recommended as I saw no sign of gluten free choices. 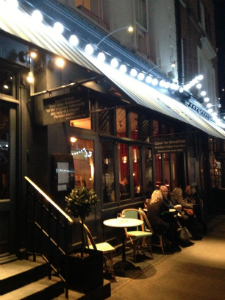 Not everyone has time to email these restaurants in advance, I took along 5 customers to Côte because I knew I could eat there, worth other Restaurants remembering! I can definitely recommend Côte Restaurants to fellow Coeliacs and those who are gluten intolerant . Maybe by the time You visit the gluten free options will be clearly marked on the menu. The Bodyguard musical at the Adelphi Theatre was very good. Many of the best known Whitney Houston songs sung by Beverley Knight. If you are a fan of Whitney or the film The Bodyguard its worth a visit. 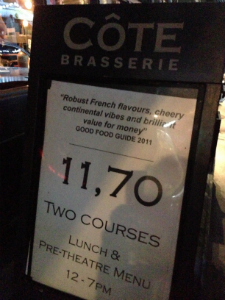 The Côte restaurant is nice and close for a pre theatre meal too. On Sunday we took a drive over to Overstrand and Cromer. After walking for miles on the beach we needed somewhere to warm up and have some delicious lunch. I remembered about Art cafe which caters for gluten free and vegetarians. I had come across this lovely cafe in the summer, so we made are way to Glandford a beautiful hamlet in the Glaven valley. About 2 miles from Holt and Blakeney. 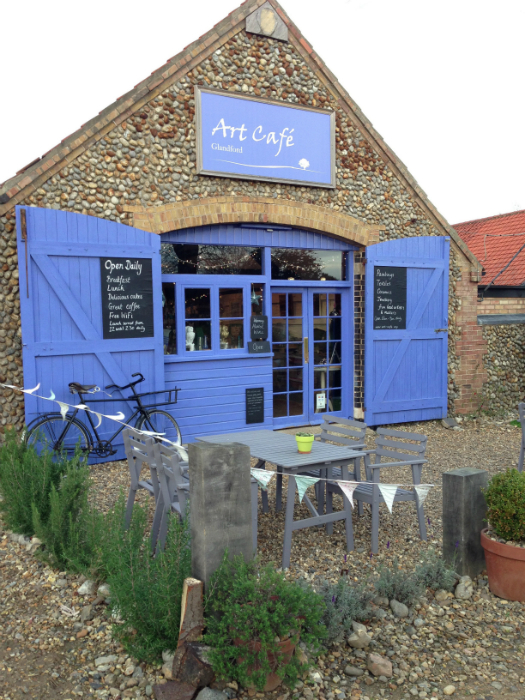 Art cafe is North Norfolk’s only vegetarian restaurant, artisan cafe and art gallery, You will easily spot the cafe as its brightly coloured paintwork draws you over. 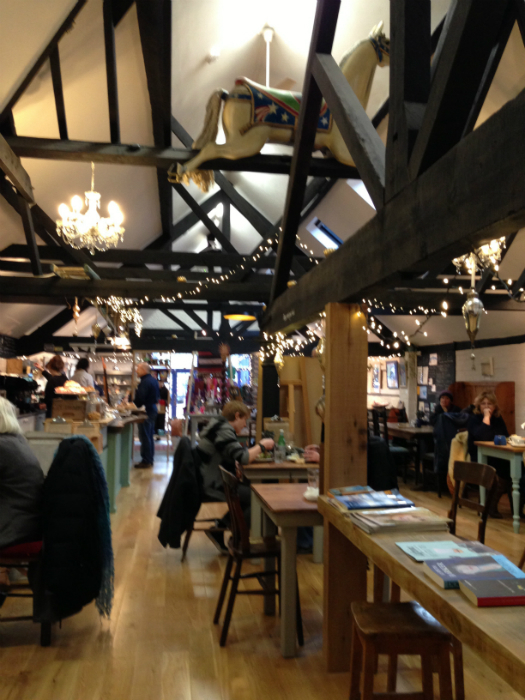 Inside is a selection of local art and craft which is available to buy, further inside is the cosy restaurant with a wood burner to keep you warm and when we visited the interior was decorated with pretty christmas lights. We settled down next to the wood burner after eyeing up all the cakes and breads on display. I quickly spotted a gluten free lemon polenta cake under a glass dome and some delicious looking bakewell slices. Mr S chose the chestnut and sage soup for his lunch and I went up to chat to the waitress about what they could make for me. Never easy as not only can I not have gluten, I cannot tolerate yeast (wine, vinegar ) and onions. The waitress kindly said she would go and talk to the chef who came out to chat to me straight away. He suggested maybe some grilled vegetables and a dahl and said If I was happy for him to surprise me he would go and see what he could create. It is very nice to find a chef who was happy to work around your food intolerances. I waited eagerly for my lunch. 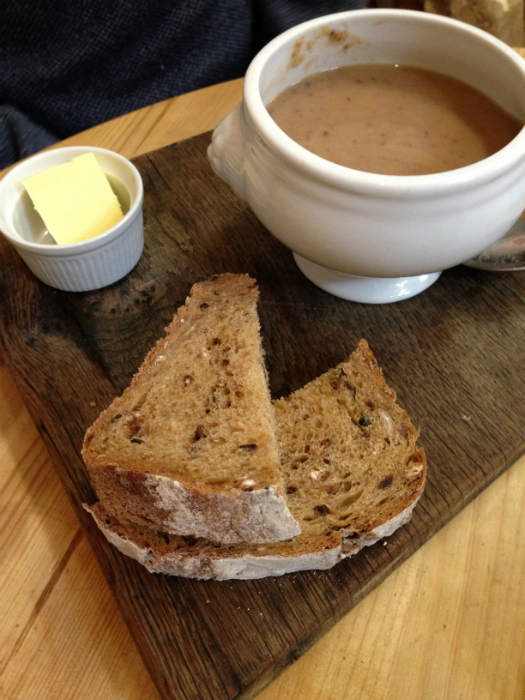 Very soon Mr S had his steaming hot chestnut and sage soup served with crusy slices of homemade bread and butter. you can have gluten free bread with your soup too. 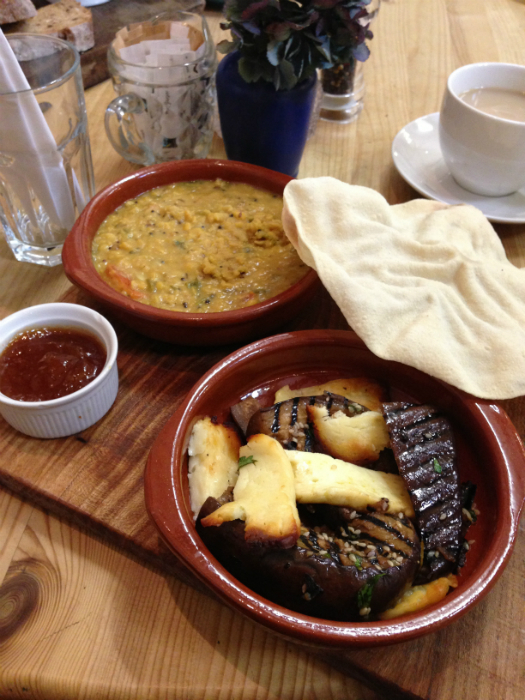 Then the chef brought out my amazing lunch of grilled halloumi with grilled aubergine in a tapas style dish, another full of a delicious dahl all served on a board with a gluten free popadom and some mango chutney. My lunch was one of the most exciting lunches I’ve had at a restaurant for a long while. Usually my lunch lacks flavour, In fact usually I have to just have a slice of cake as its often the only gluten free choice .This meal was bursting with different textures and spices. I will now be trying to copy this lunch at home. Chef was keen to let me know that they could accommodate other dietary needs. They are open 7 days a week 10am – 4pm. The only thing I would like to see improved upon would be to ensure any gluten free baked cakes, biscuits etc are covered and clearly away from any gluten filled products with a separate utensil for serving them. 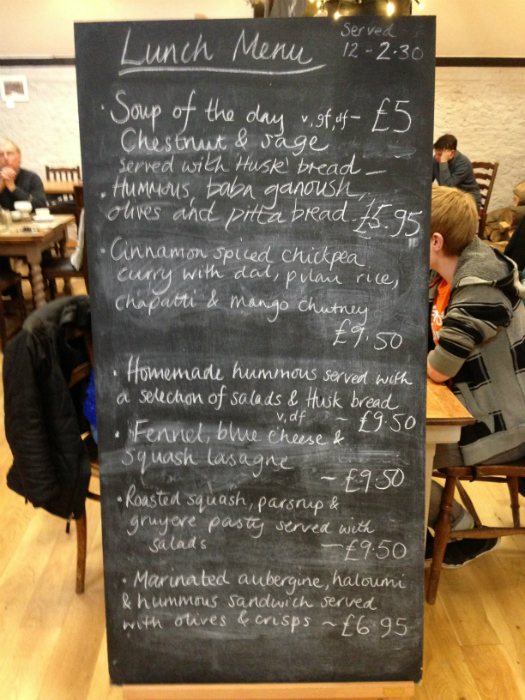 If you are in North Norfolk I can recommend this very individual restaurant cafe and art gallery.